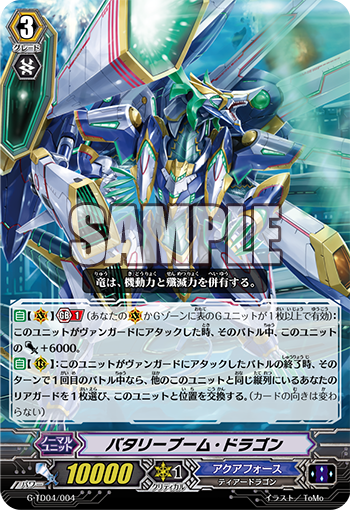 Today's Japanese card of the day is an update to the Aqua Force's serial attack strategy, and the first card revealed from the clan's upcoming second trial deck, Jaime Alcaraz's G-TD04: Blue Cavalry of the Divine Marine Spirits. Battery Boom Dragon is a twist on past support cards like Benedict and Lysandros, filling their position in creating multiple attacks to trigger the vanguard's skills with conditions like "if it is the fourth or greater battle of the turn," while also harassing the opponent with glancing blows. Unlike his predecessors though, Battery Boom can fill a role in the vanguard circle in the event of a worst-case scenario. Battery Boom Dragon's primary skill lets him change positions with a unit in the same column as himself after he attacks, as long as it was the first battle of the turn. Like with the Storm Rider series of the past, the rest or stand position of the units does not change, so you're intended to place an 11~12000 power independent attacker behind Battery so that it can attack after he has and increase the number of attacks in the turn. This makes it possible to get to the fourth battle of the turn, by attacking with Battery Boom, swapping positions with the unit behind him, attacking with the other rearguard lane, and then attacking with the vanguard for the fourth attack. The primary problem with Battery Boom is his 10000-power base. In order for his attack to connect with most vanguards of the present format, you have to use either Battle Siren Mallika's or Neferli's skills to pump up Battery Boom by +3000 first. Otherwise you're only attacking to increase the number of attacks that turn to meet a skill threshold and exchange positions with Twin Strike Brave Shooter or Gregorios. This is not necessarily a wrong approach, but Battery Boom is in competition with Diamantes, Lysander and Lysandros. Diamantes at least attacks for 11000 power before changing positions, while Lysander and Lysandros can both restand after being boosted instead of needing to rely on position-changing, and attack rearguards that they can actually hit afterward to rack up the number of battles on that turn. So in the rearguard Battery Boom is generally outclassed, but he does have an advantage on the vanguard circle that none of these past support cards could fill. Like many lesser grade 3s introduced in the wake of G-BT01: Generation Stride, Battery Boom has a generation break skill that follows the same design as the initial limit breaks of BT06. For generation break 1, Boom gets +6000 power when he attacks the vanguard, and accounting for the general inflation of grade 3s over the past several years from having a normal base power of 10000 to 11000, this means that cards of Boom's type are effectively the Garmores of the new era. The bar has been raised from 15000 to 16000 power, and having face-up G-units has replaced having four damage as a skill condition. In fact, Aura Shooter Dragon in G-TD02: Divine Swordsman of the Shiny Star is a near equivalent for Great Silver Wolf Garmore, only calling grade 2 and greater cards instead of lower for the same cost and timing. So unlike Diamantes, if you're forced to ride Battery Boom and have no other options, you still have a 10000-power base instead of 9000 power, and you have an offensive vanguard skill to fall back on that can make a 21~23000 power column with a 5000-power booster. Even if you face a Link Joker matchup and find your booster locked, Battery can still fight back with a 16000-power attack as long as you have access to stride early on. This flexibility between the vanguard and rearguard circles gives Battery a good balance between parameters that other Storm Rider derivatives do not have, and because of his rearguard role this clan in particular is more likely to run their generation break Garmores than contemporary clans are. While not a game-winning card by any means of the imagination, Battery is a very respectable upgrade over Diamantes. The question is whether or not you really need Battery Boom. With a variety of effective grade 1 and grade 2 support that can achieve his skill indirectly using rearguards that can already hit for the right numbers, comprising Wheel Assault, Spyros and their legion equivalents Starless and Tempest Boarder, Battery Boom only has a place if you are running a deck that is both non-Blue Storm and non-legion. Aqua Force is likely to receive its own generation break grade 1 and 2 units with similar skills to these cards, so Battery Boom may well be dead on arrival.